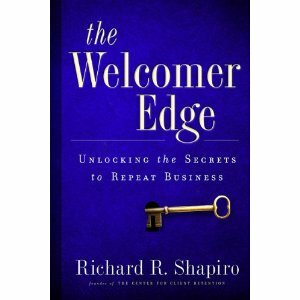 I recently finished reading The Welcomer Edge: Unlocking the Secrets to Repeat Business by Richard R. Shapiro who is the founder and President of The Center For Client Retention (TCFCR). Mr. Shapiro’s organization provides research, training, and consulting services to Fortune 500 corporations on how to improve customer service. We begin with the Welcomer or “Doctor of First Impressions.” These are the customer service representatives we all want; these are the people who enjoy their jobs, enjoy working with customers, and these are the employees who should be appreciated and valued. Most likely these are the people who volunteer in our own communities and love working towards the welfare of others. These are the people who make a difference. Robots are the next classification and encompass the largest proportion of sales associates and representatives. Although they value and appreciate their positions in one’s company, they most likely view their jobs as exactly what is written in the employee manual and rarely step out of the box to do anything else than the obligatory customer interaction needed to get through the work day. Moving on to the indifferent sales and customer service representative, these are the employees likely to be chatting on their cell phones or those who scarcely acknowledge a customer as she walks through the door and begins to shop. And the final category are those we rarely encounter, however somewhere in our lifetime, we meet the hostile employee we hope never to meet again. That hostile employee can be rude and nasty and make you wonder why he even has a job. The Welcomer Edge is divided into personal experiences and real business examples describing many of the author’s real world experiences applicable to either small or large organizations. The author presents examples in each chapter in order to highlight the advantages of nurturing customer relationships. Customers are not just seen as customers; skilled salesmen see customers as people first and remind all of us that good will, meaningful conversation, honesty and smiles go a long way when developing customer loyalty. Good customer service is good for today. Having a welcomer provide good customer service wil make you return tomorrow. That’s a big difference. So what makes a great welcomer? According to Mr. Shapiro, these are the people who are of course helpful, but in addition these are the people who show customers they care. A question is never just answered with a “yes” or “no” answer even though that one word would be correct for the circumstance, but these are the very people who understand that it’s not just “selling” a service or a commodity – it’s helping someone to find what they need or want. It’s what makes the difference in businesses like Zappos or the Ritz Carlton – it’s the attitude that some people have developed to make that initial contact with a customer the reason for that customer to want to come back. Each of the eleven chapters of the book provides practical suggestions, specific examples, and addresses how business owners can connect the dots to better customer service. At the end of each chapter, “power points worth repeating” sum up the power of welcomers and how each missed chance can ultimately mean a missed opportunity in business. Bottomline: Having a welcomer, or “Doctor of First Impressions,” are those employees who make customers feel important. From the moment a customer walks into a store the customer feels appreciated. By the time they get to the check-out experience, a connection should already have been made, and that lasting impression is what will keep that customer coming back again. The little things an organization does are the very elements that make the big difference in the ultimate customer service experience. Pros: Mr. Shapiro’s book was well-written. He presents his experiences in a variety of different venues. The reader can’t help but smile at some of his personal experiences; many of them most of us can probably relate to at one time or another. Cons: A few of the author’s examples might be a bit drawn out and not realistic for many people reading this book. For instance, I’m not sure how much time a business person would want to listen to his server’s vacation experiences or personal stories when often time is of the essence. That just might be all about one’s perspective though. Interested in purchasing a copy? You can get it from Amazon.com ($11.90 in paperback) by clicking here. Thanks for the recommendation Cheryl! I’ll have to give this a read. I enjoyed the review. I agree, first impressions are important; it is what will have the customer coming back over and over or them never returning. I’ll check this book out!